Tributes have been paid to a Kent county councillor who led a task force in response to the closure of the Thamesteel plant in Sheerness. 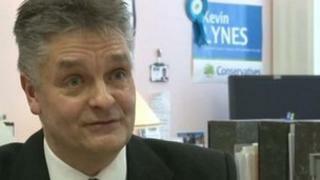 Kevin Lynes, Conservative councillor for Tunbridge Wells East, collapsed at his gym on Friday. He was 53. He was elected to the County Council in 2001 and became cabinet member for regeneration and economic development in 2008. Thamesteel, which employed 400 people, went into administration in January. The task force was set up to support the workers who lost their jobs and liaise with the administrators. It urged other local employers to take on former Thamesteel apprentices and students so they could complete their qualifications. County council leader Paul Carter described Mr Lynes as very hard working and dedicated to the residents he represented. "He made an enormous difference in recent years, endeavouring to help and support the business economy," he said. "He will be enormously missed not only in the corridors of County Hall but around the county. "Our thoughts, prayers and heartfelt sympathies go out to Kevin's family and his many friends."